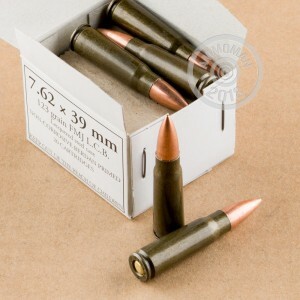 This 7.62x39mm cartridge by WOLF Performance Ammunition sports a 123 grain projectile, which is the same bullet weight offered by the original Soviet M43 variant of the cartridge. The round’s bullet’s full metal jacket suits it ideally for long sessions of training and target practice, as it will prevent excessive fouling within your AK-47’s bore so you may enjoy more accurate shots in between cleanings. The “L.C.B.” on these rounds’ box stands for “Lead Core Bullet,” which is fairly standard stuff for this kind of ammo although the projectile's jacket features some steel so it is attracted to a magnet. 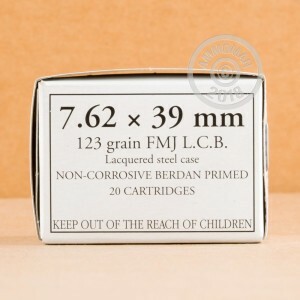 This cartridge features a Berdan primed steel casing. Russia has specialized in making steel casings for a very long time, which they favor owing to their far lesser cost to manufacture over traditional brass casings. That makes this round very attractively priced, albeit at the trade-off of not being reloadable. If you hadn’t planned on handloading anyway, there is practically zero reason not to capitalize on so hard-working a great round. too quickly, no brass !!!! I will order again from ammoman, I had a slight issue my fault not theirs, contacted their customer support and was taken care of. My order was shipped promptly and packaged well. I got exactly what I expected and at a great price. Buying another 1000 once I get close to running out of the last case. This ammo groups well. I’ve only fired 200 rounds so far. Had one dud. Performed well and great price. Order came in ahead of time and in good condition. Arrived very quickly never had a issues with any of the rounds I shot. Will definitely buy more ammo l.
Top notch customer service stayed in touch untill my rounds were delivered . Will deff stock up my ammo through ammo man . Can not find a better deal anywhere else . With free shipping can not beat ammo man . What to say? Good price for today's market. Pull the trigger and it goes bang. Can't reload, some ranges won't tolerate bullets with steel in 'em. Nicely packaged and will order more ammo! always ... ALWAYS goes "bang"
IMHO, the white box is worth the few bucks more. NEVER a problem with it - and i've shoot PLENTY of it. as for AMMOMAN --- these guys are the BEST! SUPER-FAST shipping - my last order arrived in Illinois in 23 hours!!! how the heck do they do that! i recommend AMMOMAN to everybody! Shot 400/1000 rounds. So far no problems. Best price around. Can't go wrong to stock up on these for range practice. I have ran about 200 rounds thru my Century arms AK. I have a slide fire on it and have only shot it with it on. At full tilt- semi/full auto operation, the ammo hasn't failed once. Don't know how accurate it is, but a lot of fun and reliable. Great ammo- I would order it again! Runs great in all my Ak's awesome price and quality. No issue down range. Works. I agree fully with one reviewer who wrote that this resembles the old style Wolf ammo of a few years ago. It is lacquer sealed which is no big thing, a little solvent and a bore brush every 1-2000 rounds and there is no problem. It also seems to have the older Wolf powder mix and burns a bit dirty (but its just carbon, no big scrubbing issues here). I personally would spend a few extra dollars and buy the polycoated ammo, it is SLIGHTLY easier on the chamber as the polycoated ammo is easier on chambers than brass cased ammo. If you buy a couple of boresnakes, one for solvent and the other for your favorite oil, then a couple of passes with first the solvent and then the oil and you are good to go. If you shoot either an AK or an SKS this ammo is NOT A PROBLEM AT ALL and if your wallet is a bit thin then by all means buy this ammo. It is 100% reliable and is loaded consistently and will group VERY acceptably. Is the newer polycoated ammo better? Yep. Does it cost a bit more? Usually. Go with your wallet and remember nobody every had too much ammo and never will. Tested it in multiple rifles, went bang every time. Accuracy was average compared to other brands. This is great practice or tactical ammo and reminds me a LOT of the "original" Wolf ammo before "Polycoating". It produces a slight bit more carbon residue and after one heck of a lot of rounds you may have to clean some lacquer build up from the chamber. It shoots true and is well worth the money just remember that this ammo is lacquer sealed and not sealed with the more modern polymer compound. GREAT BUY at this price! I got 2k rounds just to check it out - should have followed my gut feeling and ordered 5k. Ordered on Thursday - free shipping - arrived Saturday afternoon. Now that's cool! Wolf White box is still WOLF! Found this information on the "net" about this WOLF White box ammo.